TestComplete 14 introduces support for BDD scenarios, HipTest, Web Components and other modern technologies to help you create more robust automated tests and do this faster and easier than before. Below is a list of major improvements relative to the previous product version – TestComplete 12.60. For information on the changes made to other versions, see Version History. TestComplete 14 offers support for BDD tests. You can create, automate and run BDD tests from TestComplete along with other tests of your project. You can write feature files in TestComplete, import them from HipTest, or load them from a file on your hard drive (this can be, for example, a feature file you created for Cucumber or any other projects). Feature files should be written in Gherkin. TestComplete includes the new Gherkin editor (see the image above) that supports the language syntax and recognizes both English and native-language Gherkin keywords. The editor also has a special menu item to generate script functions for test steps and to help you automate scenarios faster. For complete information on creating, automating and running BDD tests, see Behavior-Driven Development (BDD) With TestComplete. HipTest is a cloud-based testing platform for software development and software delivery teams. It helps all the members of your team – QA engineers, developers, managers, subject matter experts and others – create, maintain and run BDD tests for their products. TestComplete 14 introduces built-in support for HipTest. It enables you to import feature files from your HipTest project, automate them and run automated BDD tests from within TestComplete. You continue creating and editing your test scenarios in HipTest, and TestComplete will automatically update the imported scenarios with their newer versions from HipTest before your open your project or run a test in TestComplete. If you change an imported scenario in TestComplete and save the changes, TestComplete will automatically forward them to HipTest. Moreover, TestComplete will automatically post the results of the automated test run to your HipTest project, so you will be able to see them along with other test results in HipTest. For complete information on creating, automating and running HipTest feature files in TestComplete, see HipTest Integration. Shadow DOM. Now your web tests can interact with web elements belonging to open Shadow DOM trees. Custom Elements. You can record and simulate mouse clicks, keystrokes and other user actions on custom elements. Chromium Embedded Framework (CEF) version 3.3578.1860. One more thing that affects web testing with TestComplete: Windows 10 October 2018 Update introduced a new behavior of the Edge browser. When you close the browser, the browser’s process is not terminated, it remains in the system. This can cause various issues in your web tests. For instance, the Sys.Browser() or Sys.Browser("*") method calls and other script statements that return an active browser will return the Browser object that matches the running Edge instance. This might be an issue for your tests if they check whether a browser is running when a test is starting or finishing. In addition, if your test tries to open a web page in a suspended Edge browser, the browser will fail to open the needed page. Please keep these issues in mind and update your tests, if needed. See Possible Issues With Web Testing. TestComplete now includes predefined profiles for mobile browser emulators for the latest iOS and Android devices. You can use them to test your web sites for cross-platform mobile compatibility. Support for Jenkins Pipeline. You can use the TestComplete Support plugin for Jenkins to run TestComplete tests as part of Jenkins Pipeline. See Configuring Jenkins Pipelines to Run TestComplete Tests. Support for Electron 3. You can now create, record, and run automated tests for Electron-based applications created with Electron version 3.0.2. Support for Atlassian JIRA 7.12. You can create issues in JIRA 7.12 (either self-hosted or cloud) directly from the TestComplete IDE. Developer Express WPF controls (GridControl and BarManager) ver. 17.2.3, 18.1.3. Telerik ASP.NET AJAX controls ver. 2018 Q3. Support for Windows 10 October 2018 Update. You can create and run tests on this update of the Windows operating system. Improved performance. We have optimized a number of internal algorithms to streamline frequent operations and improve the product performance in general. 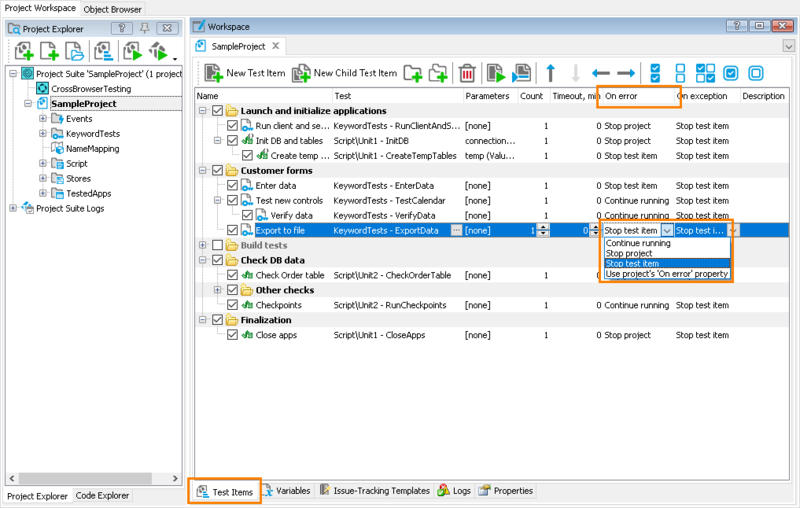 Passing project and project suite variables to ReadyAPI (and SoapUI) tests as parameters. See ReadyAPI Test Editor - Properties Page. Updated format of project files. We have changed the format to improve support for source control and make merge operations easier. Updated UI. TestComplete has got larger toolbar icons. Also, we have redesigned the New Project and Record Test wizard to help you get started faster. 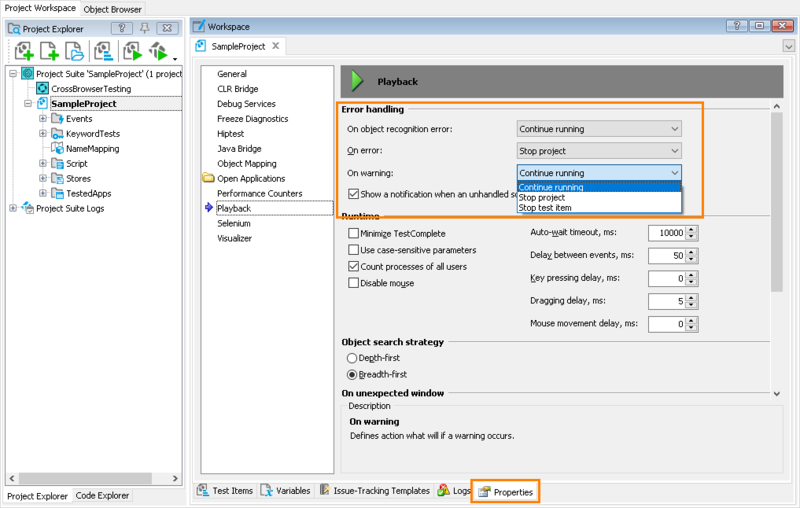 Record This Routine – Starts recording and appends the recorded script statements at the end of the current script function. Add Routine to Test Items – Helps you add the script function under the mouse pointer to test items of your project. The Additional Info panel of the generic test log page has been renamed to Details. New projects created in TestComplete no longer have the Advanced folder added automatically, the project items are included in the project as direct children. You can still create custom folders in your project and add project items to them manually. We have fixed a few issues reported by our customers. The project properties that control the project behavior when errors and warnings occur during the test run are now grouped into the Error handling section in project properties. The On error property of test items now overrides the project’s On error property. Otherwise, the test items will use their own On error property. If an error occurs during the test item run, TestComplete now reacts to this immediately, rather than after the test item run is over. For example, suppose the On error property of some test item is set to Stop test item. When an error occurs during the test item run, TestComplete will stop the test item immediately and go to the next test item. The previous versions of TestComplete let the test item run to the end. By default, all new projects you create in TestComplete are configured to stop the entire test run when an error occurs. You can use the project’s Error handling properties and the test item’s On error and On exception properties to control this behavior. See About Controlling Test Execution Flow. When you open a legacy project in TestComplete 14, the latter will convert the property values in the project file to the most suitable new values. See Migrating Projects Created in Earlier Versions for details. Note, however, that since the new behavior differs from the previous one (for example, now if an error occurs, TestComplete stops the test item immediately, while the previous versions let the item work to the end), you may notice a slightly different behavior of the test runner. The new Error handling > On object recognition error property has replaced the Stop on window recognition error property of your project. The new property handles recognition errors that occur when TestComplete is unable to find an object by its full name in any tested application. The old property affected only those errors that occurred when working with processes and objects of Win32 applications. The values the TestItem.StopOnError and TestItem.StopOnException properties accept have been changed. See the property descriptions for details. Similarly, the values the Project_TestItem.StopOnError and Project_TestItem_StopOnException properties accept have been change. See the property descriptions. If you use these properties to access your test items, you may need to update your code. TestComplete no longer supports iOS version 9.x and iPod touch 5 devices. TestComplete no longer supports Objective-C and Swift applications created with Xcode 7. TestComplete no longer supports the tcCEFHook library for compiling CEF applications. For this purpose, use automatic instrumentation. Adding TestComplete tests to builds controlled by Team Foundation Server 2010–2013. Adding TestComplete projects to Team Foundation Version Control running on Team Foundation Server 2010–2013 directly from the TestComplete IDE. Adding information on found issues to work items managed by Team Foundation Server 2010–2013 from TestComplete test logs. The ability to add information on found issues directly from TestComplete test logs to the Axosoft OnTime database has become deprecated. The TestComplete installer copies the Axosoft OnTime plugin file to your computer, but it does not activate the plugin in TestComplete. If needed, you can do this manually. Support for Axosoft OnTime will be removed in one of the future releases. TestComplete wizards and dialogs don’t have commands for adding web pages to the list of tested applications. This functionality was used rarely. Typically, web tests include instructions for navigating to the tested web pages. Starting from TestComplete version 14.0, the Code Explorer panel is hidden by default. 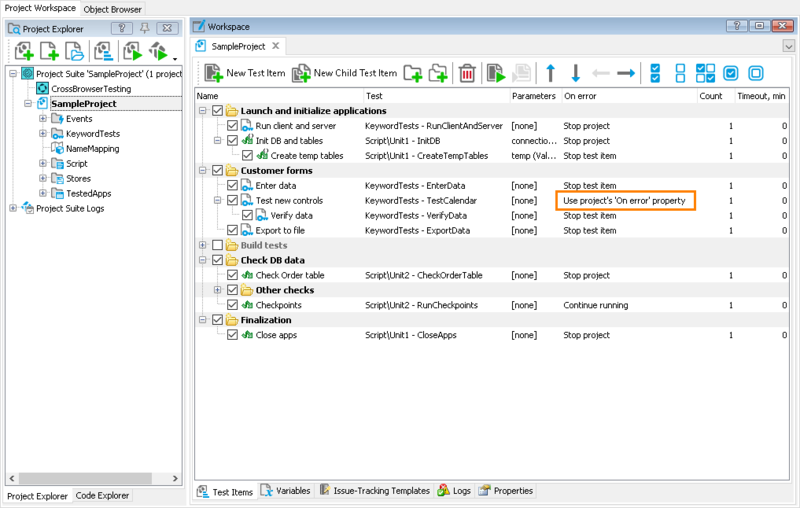 You can make it visible by selecting View > Select Panel > Code Explorer from the TestComplete main menu. The New Project wizard does not include any means for adding web pages to the list of tested applications in your new projects. This happens because web tests have test commands that open the tested pages. For example, TestComplete automatically records the navigation command that opens the tested web page when you are recording a web test in any of the supported browsers.